Money is earned. Because most kids are given everything from birth, they don’t understand the concept of having to earn money until it’s been explained, or better yet, they have to do it themselves. One way to teach children this concept is by giving them the option of doing chores around the house for an allowance or other reward. There are also lessons to be learned from opening a lemonade stand, mowing the neighbor’s lawn, or taking that first babysitting job. By encouraging children to start earning their own money, they start to better understand its value. 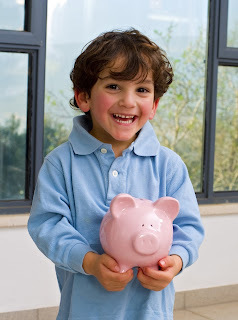 For an extensive list of ideas on ways kids can earn their own money, visit this article about How to Make Money as a Kid. Saving is necessary. As soon as your kids earn money, they will probably want to spend it all. Habits developed early on in a child’s life can make or break their habits as adults, so the importance of saving is a good lesson to learn early on. One way to make saving easier on kids is to teach them to set aside a percentage of their earnings each time they receive cash. Opening a savings account where they can see their money grow is a great way to help them grasp the concept! For example, members 12 and under at Community Financial can open a free youth savings account with no minimum balance requirements. Our Youth Club encourages our youngest members to save money by giving them special incentives and rewards when they make deposits. Keep track of your money. Teach your kids to keep a log of how much they earn, how they made the money, and how they spent it. We all know it can be difficult to keep track of our finances, so the key is to start small. What better way than to get your kids to start while it’s extremely manageable? There are even apps and online resources where kids can keep track of their funds and parents can monitor them as well. One great example of this is ThreeJars.com. The Community Financial Mobile Banking app is also an easy way to track and see your savings grow. Both are useful tools in helping kids manage their money responsibly. Seeing your child’s sense of accomplishment when they balance everything out and knowing how much they’ve saved may even inspire you! Often we look to the past and say “if only I saved more” and wish we had understood the future implications of our financial choices. By teaching children the basic concepts of earning, saving, and keeping track of their money from an early age, we can help shape their financial futures. For more information on Community Financial’s programs for kids, such as our Youth Club or Student-Run Credit Union Program, visit cfcu.org/youth.